Armstrong Steel, a Greenwood Village, Colorado based Original Equipment Manufacturer of metal building kits was recently contracted by Noel Pritchett to assist him with designing a 60’ x 70’ steel framed home with a 27’ x 39’ attached lean to including walk doors, garage doors, and windows. He instantly knew he wanted an Armstrong Steel building and said he chose Armstrong Steel Buildings because of the quality, reputation, and affordable price. DENVER –The home Mr. Pritchett built in conjunction with Armstrong Steel is located in Cedar Creek, Texas and is one of many that Armstrong Steel has worked on in Texas. In fact, Texas is one of the busier states Armstrong Steel designs buildings for. Noel Pritchett came to Armstrong Steel to get the framework he needed to build his home. Many people are using steel for residential construction simply because of the cost savings and durability. On average, a self-built home employing builders, costs 20% less than an average new-build home according to Tom de Castella of BBC News Magazine. That same study also found that the number of people building their own homes is increasing dramatically across the globe. 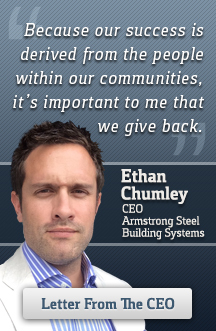 "Armstrong Steel is seeing a rise in the sale of pre-engineered building materials for use in residential construction, and consequently we are offering rebates to first time builders," says President of Armstrong Steel, Ethan Chumley. Other companies are often intimidated by the heightened level of difficulty involving designing pre-engineered homes, but Armstrong Steel’s pre-engineered designers, draftsmen, and detailers are able to quickly and efficiently get you exactly the design you want while staying on budget.